There is more in Benedict's Rule than meets the eye. Based on the rules of life of John Cassian and Saint Basil, Benedict invites us to go further back to the scriptural basis of all Christian and monastic living and pursue our spiritual journey by the guidance of the Gospel. Michael Casey brings a deep lived knowledge of the monastic tradition to this splendid set of reflections on Benedict's Rule. He manages to marry faith commitment to pastoral common sense in such a manner that monks and laity as well can find answers to that request made to the old desert dwellers: Give me a good word. Casey, in fact, gives us many good words. "The incomparable Casey has done it again. He seems to deliberately choose the most unlikely sections of the Rule of Benedict and make them into something appealing, even compelling, for the modern reader." Ancient monastic authors often stressed their wish to be of use to readers. Like them, Michael Casey has written a useful volume, a volume to live by. Drawing on a wealth of sources, and reading deeply in the book of experience, he shows what a vast perspective is indicated in the `little Rule' of Benedict, what fullness of life is in store for those who follow it with courage and coherence. This book is not an exegetical study; one goes elsewhere for such. Rather this is a wisdom text, exploring each tool in a search to comprehend these pithy sayings for good living. . . . It is his own lived experience that brightens up the text. Casey's years of cenobitic living, coupled with his perceptive eye and peppered wit give life to the seventy-four tools. In my regular university course on the Rule of St. Benedict as a mirror to present-day culture there is close reading of some chapters of the Rule. To my shame I tended to neglect chapter four a bit. Michael Casey's deep reflections in this remarkable book are nourished by a half century of monastic reading and deep psychological and existential insight. I can now draw from nearly 300 pages of wisdom on the fourth chapter of Benedict's Rule. Just to quote from Fr. Michael's preface: "There is much more in Benedict's Rule than meets the superficial eye." 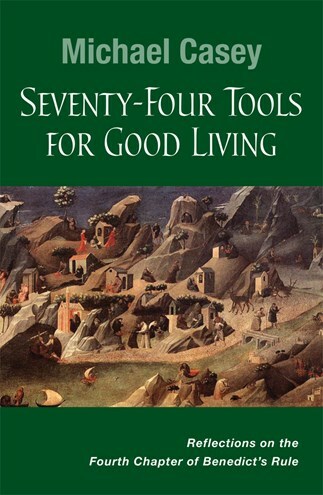 Seventy-Four Tools for Good Living is Michael Casey's ingenious way of rendering the wisdom of St. Benedict for our times. As a master teacher, he weaves together sources from the monastic tradition and contemporary insights through these seventy-four tools. If this is not his best book, it is certainly his most readable and gracious offering to his students and readers. This is a book that comes from his personal lectio and living the monastic way of life in Australia. It is also a book I can use for lectio and living my monastic way of life here in Indiana. Lay contemplatives, especially oblates, will find this a cut above the books published in most bibliographies on monastic spirituality. This book matters!